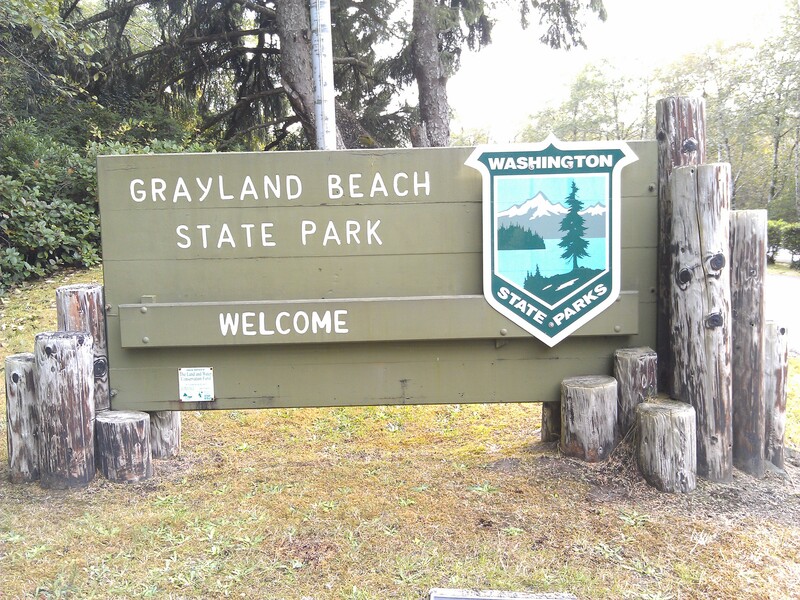 Grayland Beach State Park is right on the Pacific coast, just south of the small fishing town of Westport, WA. The campground is very nice and I would definitely call it “big rig friendly,” the roads are wide and the sites nice and big. There are plenty of trees around each site, giving you a sense of privacy. 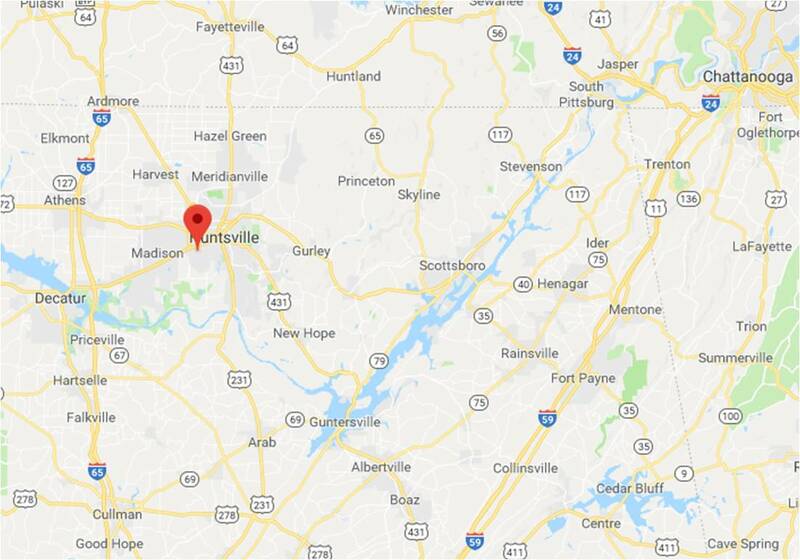 This privacy is something you don’t always see in commercial RV parks where they are trying to get as much revenue per square foot as they can. Unfortunately, most state and federal parks were built many years ago and were not designed for trailers as long as ours with multiple slide outs. Grayland Beach was a nice exception to that. As we drove around the area, Westport reminded me of the fishing towns we had seen in Alaska. Near Westport’s Westhaven State Park is the Westport Light Station. 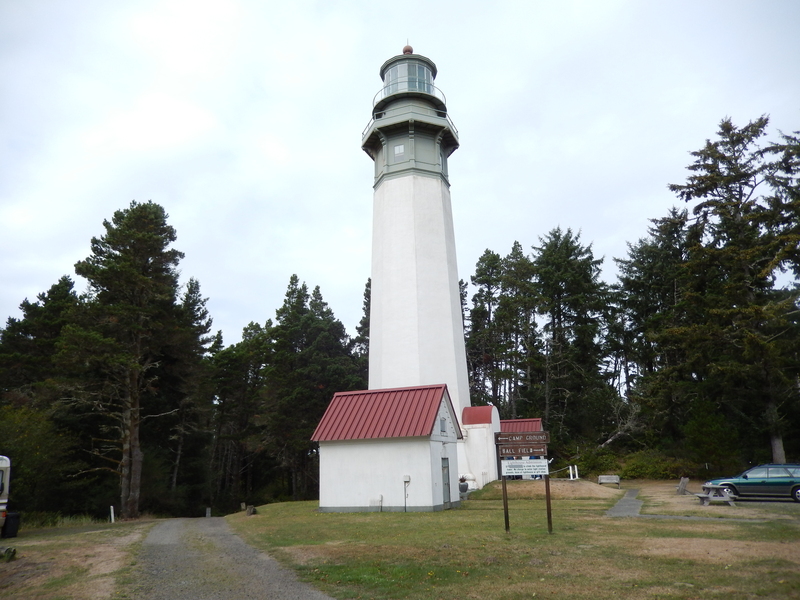 This is the tallest lighthouse in the state of Washington. Nearby is a bike/walking trail that follows the shoreline to the tip of the peninsula. It was a nice bike ride and the scenery was great. At the end of the peninsula we saw several people surfing in the breaking waves – it looked way too cold to me! 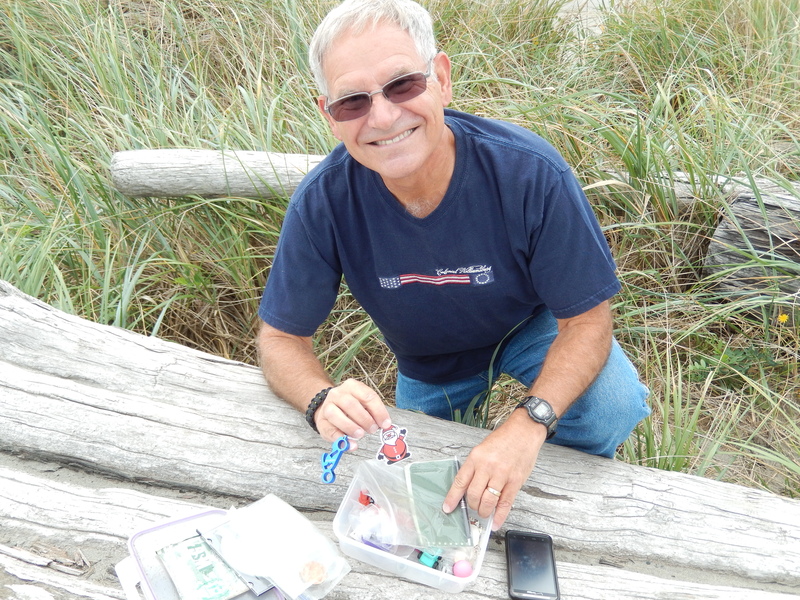 Of course, I checked out the geocaches in the area and located one on the beginning of a stone breakwater. 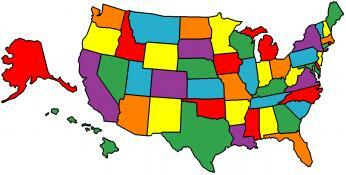 I dropped off a travel bug I picked up in Fairbanks, AK – I wonder what its next stop will be. The next day the weather turned bad and we spent most of the day hunkered down reading and relaxing. 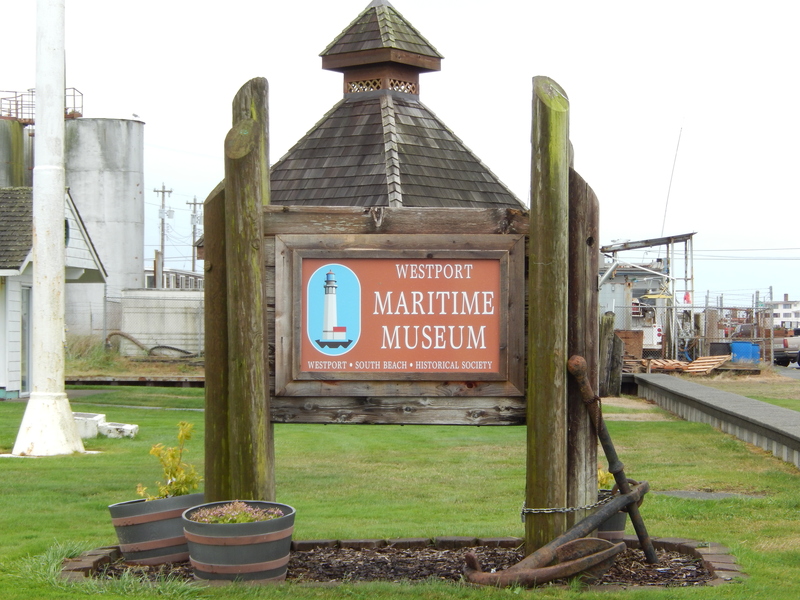 I took a short drive to visit the nearby Westport Winery and the Maritime Museum. Unfortunately the museum was closed, but I was able to view some of the outdoor displays. 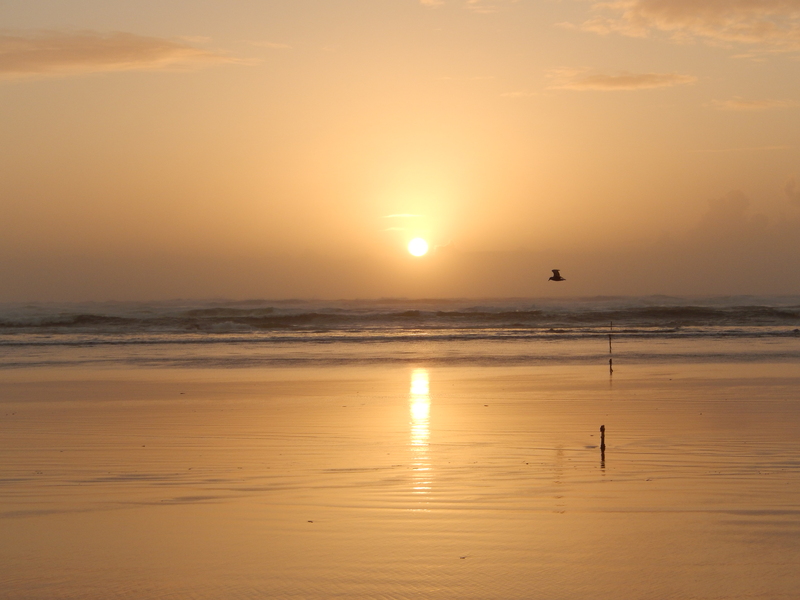 Wednesday, we wandered the beach after high tide to see what the ocean had left behind. We walked in the surf, tried flying kites (the wind was far too strong for that!) and located a couple more geocaches above the high water mark. We came down again to watch the sunset. We thought the cloud cover would be too much, but the worst clouds cleared away and we were treated to our first ocean sunset in the Pacific Northwest. 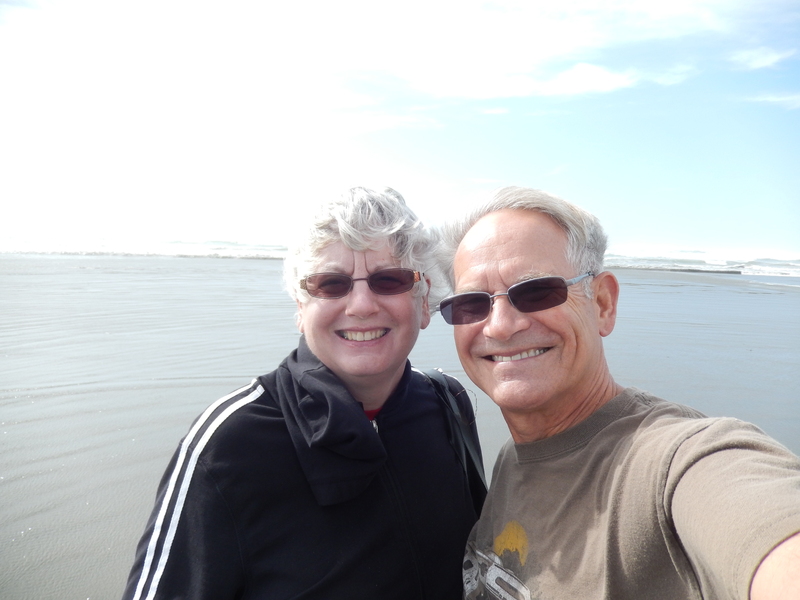 The Grayland Beach area is quite nice and we hope to return again in the summer, possibly with Scott and family. 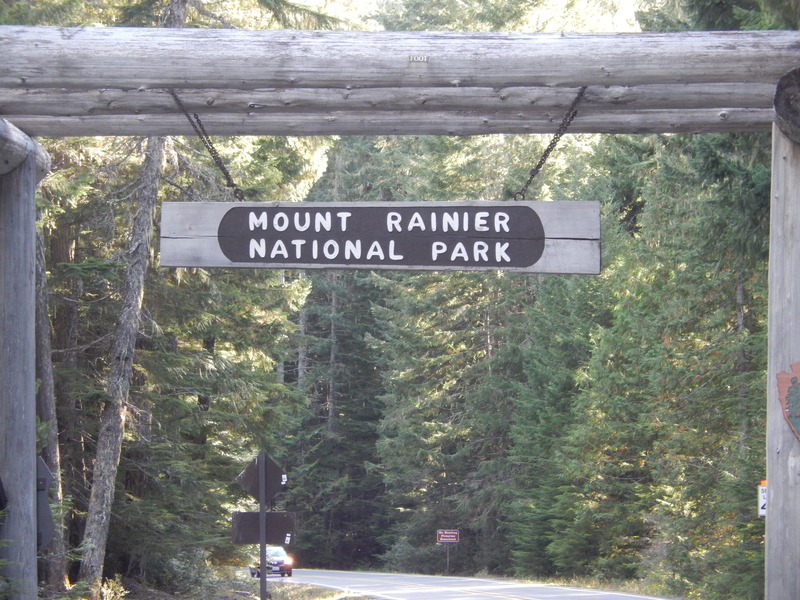 But our time was up, and on Thursday, September 25th, we drove to the Cascade Peaks RV Park, near Packwood, WA to check out Mount Rainer. When we arrived at Cascade RV Park we discovered there was a cross-country running meet going on. We took a break from setting up to watch the fun. It had been years since we watched our sons run cross-country and it was fun to watch the parents as they ran from one vantage point to another to watch their runners. Cross-country is one of the few sports where the spectators get exercise just watching! 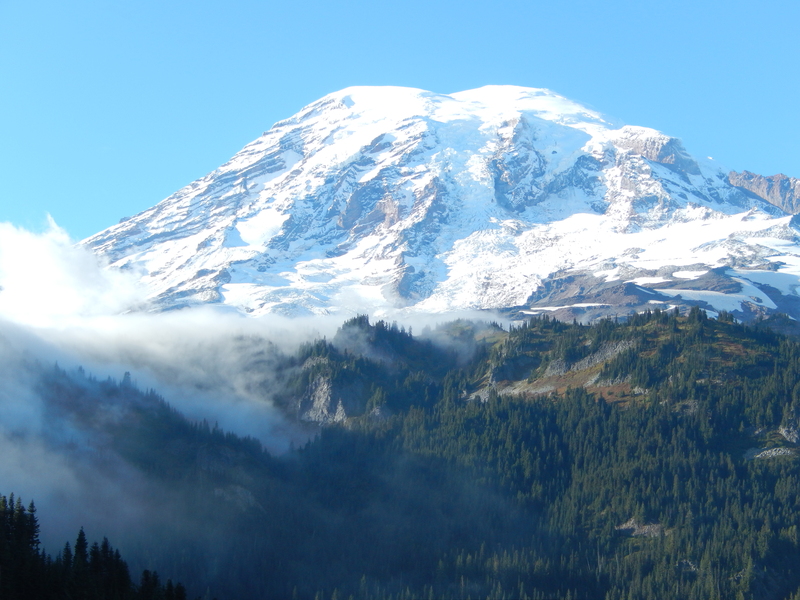 On Saturday we got an early start to go into the Mount Rainer National Park. We started at the Longmire Museum. This is the site of the Longmire Medical Springs, founded by James Longmire in 1888 and the original headquarters and lodging for the National Park, the rustic construction was impressive. 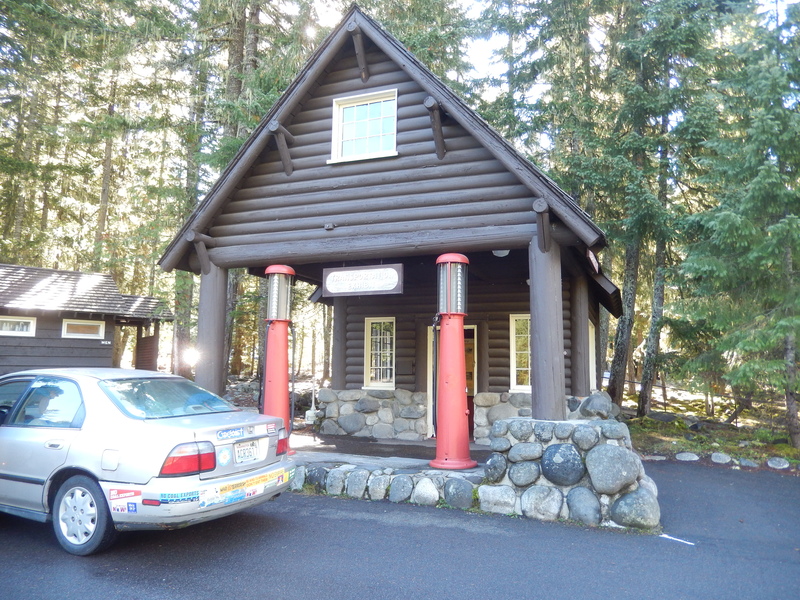 Mount Rainer was the first National Park to allow automobiles into the park, and the first gasoline filling station is now a museum about transportation in the park. We drove to the Jackson Memorial Visitor Center at Paradise. In the early days Martha, James Longmire’s daughter-in-law, looked up at Mount Rainer and the surrounding sub-alpine meadows and said, “Oh what a paradise!” and the name stuck. We hiked the Skyline Trail to Panorama Point. This is what is called the alpine zone as it is above the tree line. 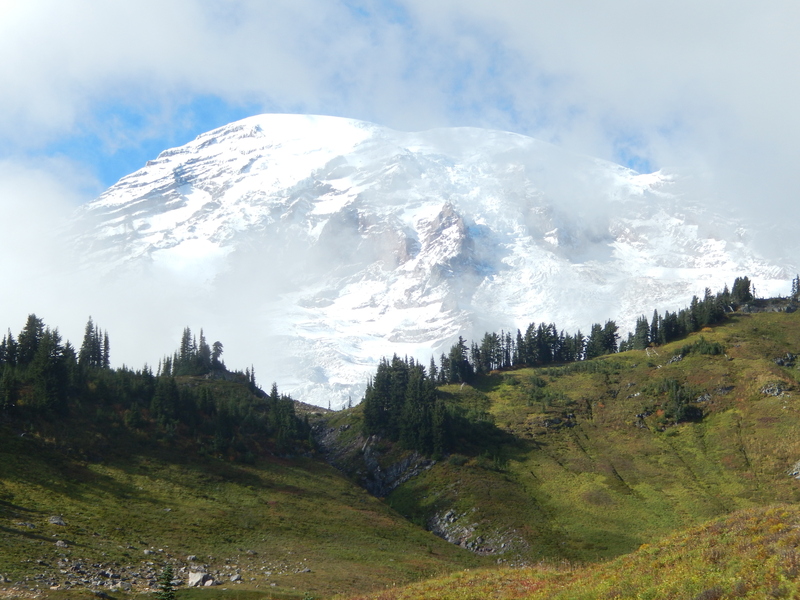 The view of Mount Rainer as we climbed up the trail was impressive. Off to our left we could see the Nisqually Glacier. As we climbed higher we could look back and see the clouds in the valleys below us – what an amazing sight! At Panorama Point, we took a break for lunch and watched a group, led by a mountaineer guide, climbing the snow field to the east. 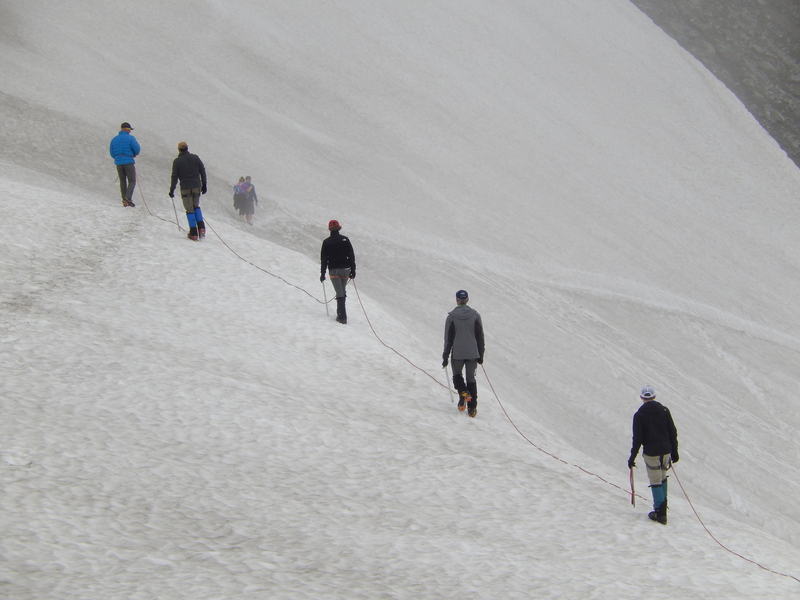 There was a shortcut we could take across the snowfield, but it was steep and treacherous. We watched as one couple tried to cross it and almost slid to the bottom. Obviously we didn’t go that route! As we were leaving the Visitor Center, clouds closed in around us and visibility to so poor I couldn’t see very far in front of the truck. However, as we reached the Valley Road the skies cleared and we had almost unlimited visibility. As we looked back toward the Visitor Center we saw it was still shrouded in clouds. It’s amazing how local the weather conditions are and how fast they can change. Our clearest view of Mount Rainer was on the Valley Road as we were leaving. The next day was clear and sunny as we drove to the Ohanapecosh Visitor Center and Campground. The Visitor Center was closed for the season, but we were able to view a trail map and plan our hike to the Grove of the Patriarchs Trail. What a change from yesterday! At Paradise we were hiking above the tree line. 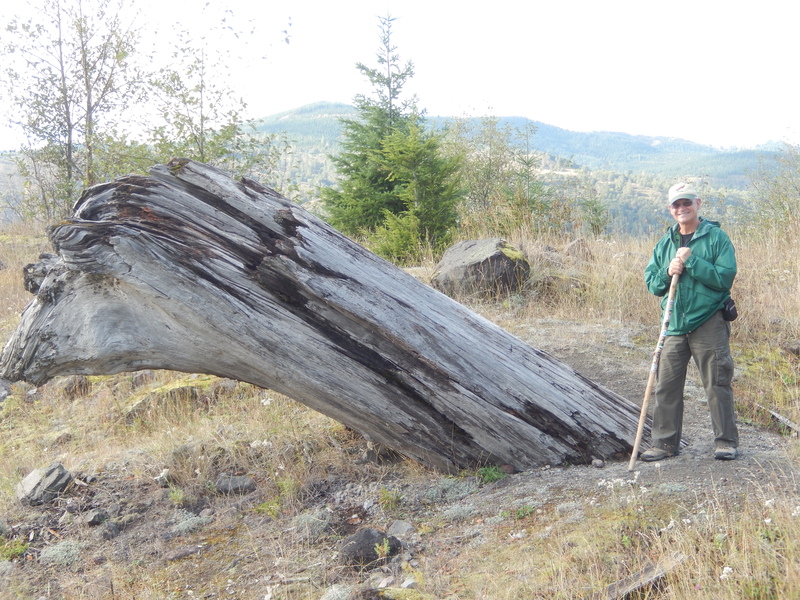 Today we were in the Sub-Alpine zone, surrounded by old growth, mature forest. The forest was so dense that we were in shadows on most of the trail. I couldn’t remember when I had been in a forest that dense. We took a break for lunch at the Silver Falls. It was nice to sit on the boulders, in the sun, overlooking the falls. 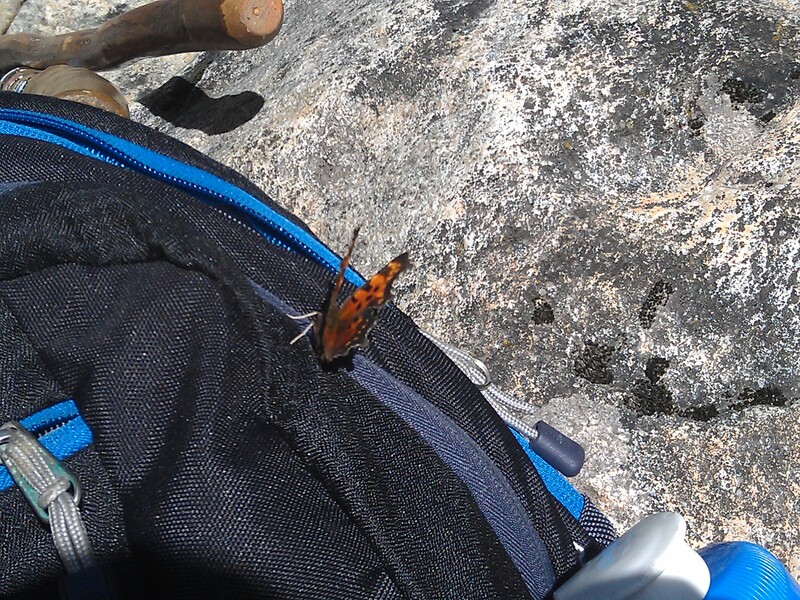 While there we saw several butterflies and one decided my backpack was the ideal place to rest. The Grove of the Patriarchs is a forest of ancient trees, some thousands of years old and over 200 feet tall. I was surprised how dense the forest floor, with a good mix of shade tolerant trees and plants. Our next stop was Mount St. Helens. 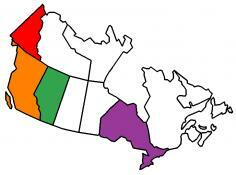 The Mount St. Helens area is divided into three areas, Westside, Eastside, and Southside. The road network is such that you can’t travel from one side to the other without driving around the perimeter. We stayed at a small campground in Kid Valley (which consists of a gas station, the RV park, and a restaurant) on the Westside. On our drive to the Mount St. Helens National Volcanic Monument, we stopped at the Hoffstadt Bluffs Visitor Center which is operated by Cowlitz County. 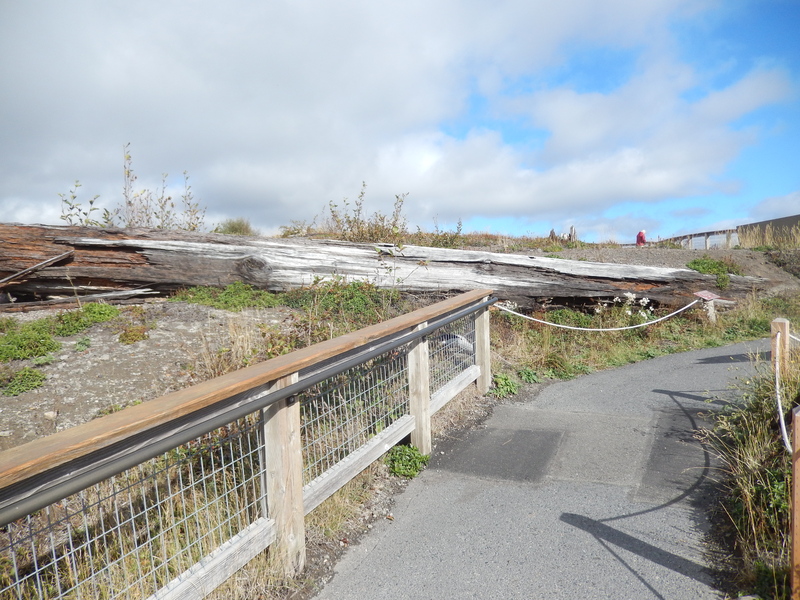 It was our first exposure to the aftermath of the 1980 eruption. 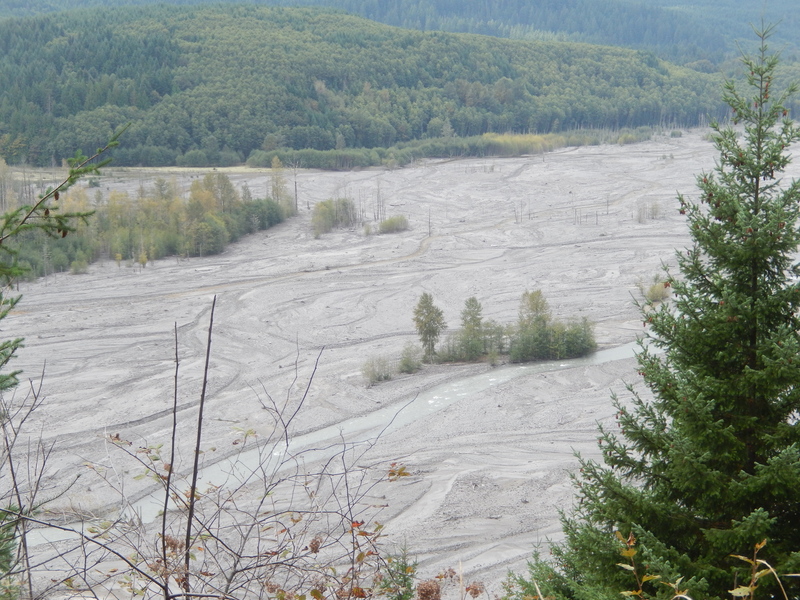 From the viewing platform you could see where several thousand tons of hot, cement-like mud flowed through the low areas, sweeping away forests and homes. 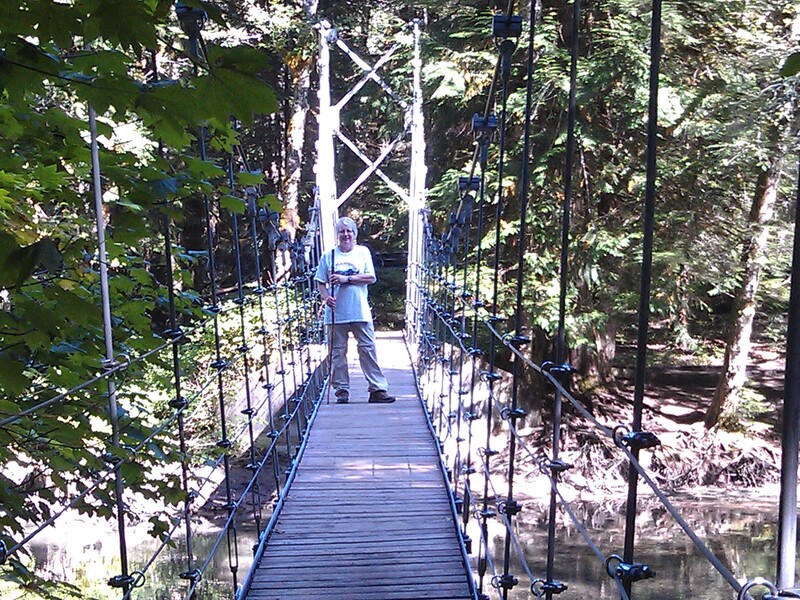 Further down the road is the Forest Learning Center, operated by Weyerhaeuser Lumber Company. Many of the displays relate to forestry and the logging industry, but also describe the eruption and the cleanup efforts. Because our visit was late in the season the Science and Learning Center at Coldwater was not open, but we were able to visit the Johnston Ridge Observatory. 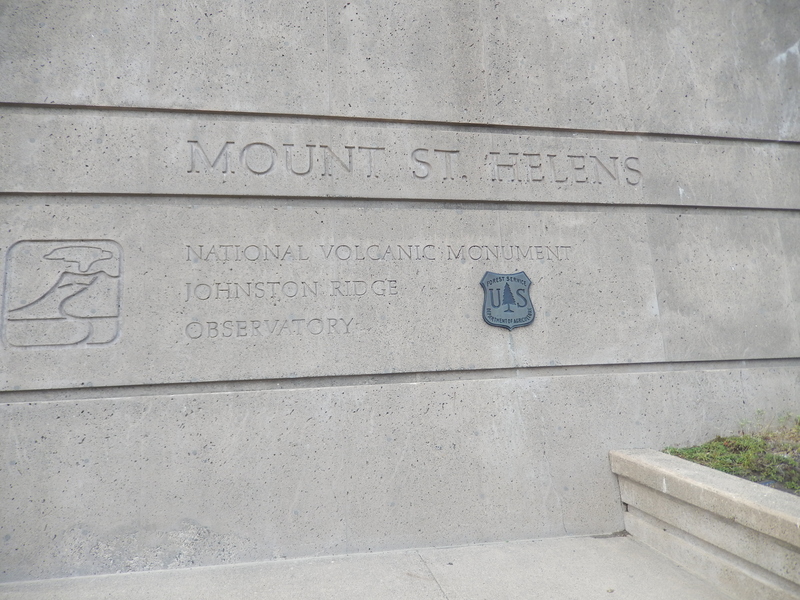 The observatory is named after USGS geologist David Johnston, who had warned of the impending eruption in 1980, and died while in an observation location just below the volcano. This Visitor Center is well done with displays, Ranger-led talks, and films that describe, in great detail, the history and eruption of the volcano. We walked the Eruption Trail to see the volcano’s crater, the blast zone, and pumice plain. Living in the Midwest when the volcano erupted, we never had a true picture of the devastation caused by the eruption. Walking the ground where it all took place brought it to life for us. On our way back to the campground, we stopped to hike the Hummocks Trail, about 4 1/2 miles from the Observatory and about 10 to 12 miles from the crater. We hiked over and around earth hummocks formed by huge boulders and other debris that was left by the flood of debris or just hurled by the explosion of the eruption. It gave me a feel for the explosive power created on May 18, 1980. On our last night in the area we treated ourselves to dinner out at Patty’s Place, the 19 Mile Roadhouse. 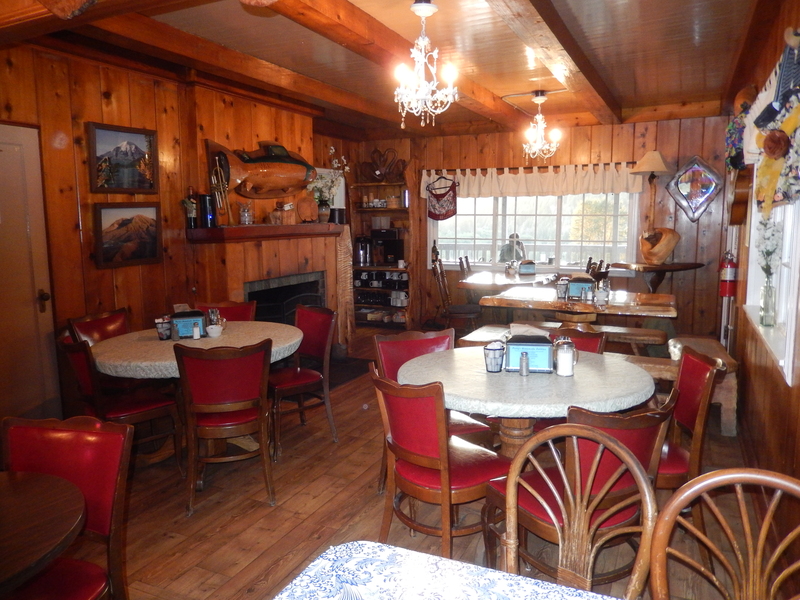 It’s the only restaurant in the nearby area, and is a delightful place to eat. If the weather had been nicer we might have sat on the deck that overlooked the North Fork of the Toutle River. Friday, October 3rd we were on our way back to Camp Murray. 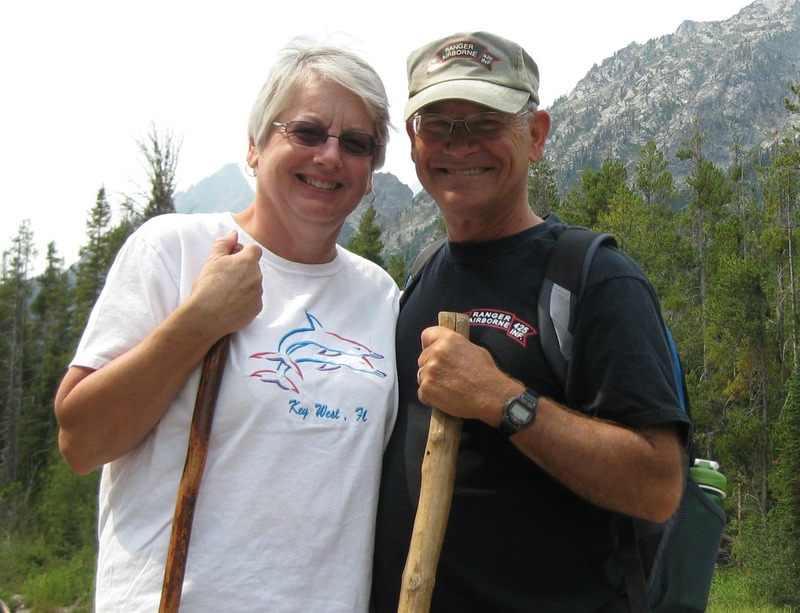 This entry was posted in Fulltime RV, Michigan Traveler, National Parks, Washington and tagged fifth wheel trailer, full-time RV, fulltime RV, Geocaching, Grove of the Patriarchs, Johnston Ridge Observatory, Lighthouse, Mount Rainer, RV Forums, Westport. Bookmark the permalink. I was 4 when Mt. 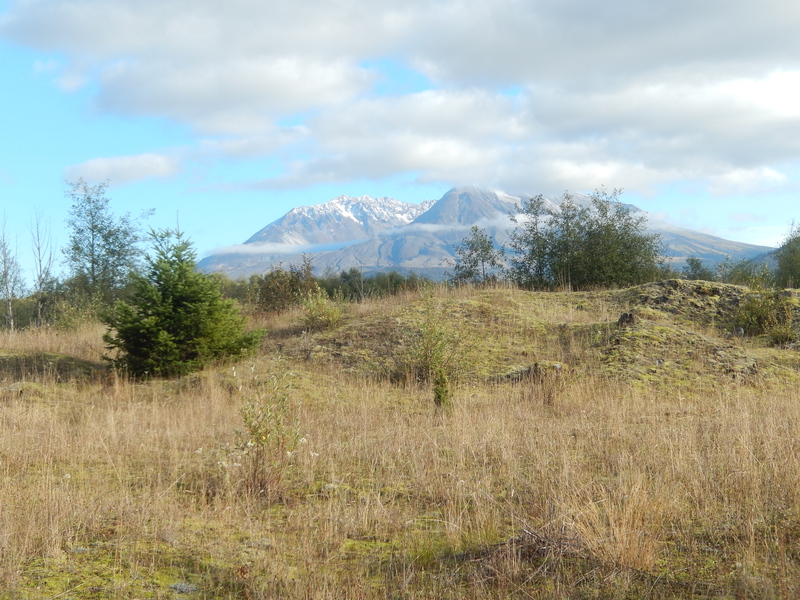 St. Helens erupted, and we live about 3.5 hours (by car) from the mountain. I still remember my mother yelling at my brother and I. We were playing in the bedroom, and she thought that we were kicking the walls. It is always fascinating to see how visible the devastation still is, even after 34 years! Living in the Midwest when it erupted, I never really realized how bad the devastation was. Our visit gave me a much better understanding and perspective.